With a focus on the underserved within our community, the RVC Tech Bus will serve as a mobile classroom for our residents from K-12 students, non-traditional students, and local workforce development partners. By meeting students where they are, the RVC Tech Bus has the opportunity to incite interest in our local youth in the areas of science, technology, engineering, math, healthcare, and more. By bringing Rock Valley College to our local neighborhoods, we hope to strengthen relationships with both the students, as well as the families who reside in those areas. As RVC President, Dr. Doug Jensen believes “people are drawn to places where they feel a sense of inclusion and a sense of hope. Rock Valley College and the RVC Tech Bus can offer a sense of inclusion by eliminating the accessibility barriers that stand between students and our campuses, and we can offer a sense of hope that each child and residents’ educational aspirations are attainable regardless of circumstance”. the RVC Tech Bus and its staff can and will be a guiding force in the life paths of those who enter. We strongly believe all children deserve the right to a quality education where fear and doubt are replaced with confidence and encouragement. The RVC Tech Bus will serve as a safe place for children to explore their interests, gain hands on experience in the many programs RVC has to offer, and will become a mobile classroom where passions are ignited and dreams are encouraged. The Rockford region is transforming with the goal of becoming a Top 25 community. To do this, we must connect our residents with the excellent educational and career opportunities we have in this region. We must develop a workforce for the 21st century that will compel businesses to locate and grow in this region so that our residents will thrive. This is a crucial piece of how we will become a Top 25 community. We have the talent and the opportunity in our region. It is up to all of us to create the pathways that will allow that talent to attain the education, skills, and training necessary to make our workforce and our community flourish. Rockford’s current and future economic development success is dependent on the education and credentialing of the local workforce. We must aggressively and strategically help our workforce acquire the skills employers seek in order to expand and diversify the regional economy. The largest projected job increase in the coming years will be in “middle-skills” jobs, defined as those positions requiring training and credentials beyond high school. As the skill levels and educational attainment requirements for fast- growing, high-demand middle-skills jobs rise, strategies must be implemented now to meet the demands of the future labor force in the 21st century economy. The "RVC Tech Bus” is just the beginning of a new way of thinking about workforce development in our region. 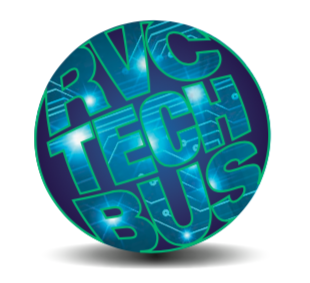 By offering of credit courses, non-credit courses, youth programming, and job skills training, the “RVC Tech Bus” removes the brick and mortar boundaries we face and makes education attainable for all.